Ahhh, everyone from this era remembers the plethora of Simpsons' related games! The NES had a few, as did the SNES and so forth. The SMS received the first two installments, Bart vs. The Space Mutants and this one here. The SMS version fares well in most areas, but it has several critical flaws that ended up disappointing me. 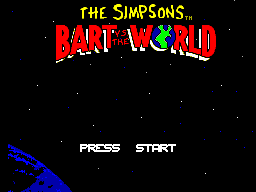 The gameplay in Bart vs. The World is simple. Bart is trying to collect various Krusty items (including some special hidden ones) while traveling the world, facing a different member of the Burns family at the end of each level. You can jump, fly when you get the Bartman icon, throw cherry bombs, etc., it has the basic platformer set-up you'd expect. Where this game is cool is the variety of things to do. In addition to several different platforming levels, each with their own quirks and secrets, you have sliding puzzles to complete and bonus rounds in order to maximize your scoring potential throughout the game. Lots of variety here and it really keeps the action fresh. For those of your familiar with a different version of this game, however, it has one critical flaw, it's not finished. You'll likely notice in the earlier levels that there are several things missing, including some bonus levels and a few stages. 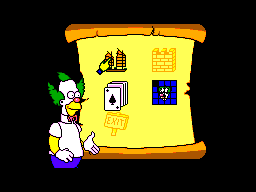 Most noticeable is the last level, where they completely stripped a critical part of the game and removed one of the secret Krusty items, thus making it literally impossible to complete the game properly. I was really bummed by this because it plays so much better than the NES version and looks better in many respects. Something tells me this was a rush to market near the end of the SMS' life because first off, it's not easy to find, and second off, it's not finished. What a rip! Still, it does have a charm to it and even if you're not familiar with the other versions you might find the ending strangely lacking. Graphically, this version of Bart vs. The World looks generally the best out of all the ones I've played. It looks a lot better than its NES counterpart, but at the same time a number of things were stripped down so I have to take off some points here. It's lacking several stages, in addition to completely removing certain things. For example, in the ice river level where you have to collect the secret Krusty, it's simply sitting on top of the igloo. In other versions, you're supposed to collect the cherry bomb bag from Lisa right before to chip away at the igloo to find it, but in this one it's just sitting right there and Lisa still gives you the bag! What? Why? You can't even hit the igloo with them and they're aren't any enemies to worry about either, since they removed them too. So, in certain areas it's a lot more crips, but in others you can see why, it's because they either didn't take the time to finish it or used up to much memory on trivial issues. Here's a big problem with this version, the sound. The sound effects are generally okay, though I've certainly heard better on the Master System, but the music is dreadful. You tend to hear the same dang song through the whole dang game and it really starts to wear you thin after awhile. Really should have worked on that some more. As for the controls, I have to say I was very pleased with this version. The controls here are much more fluid. 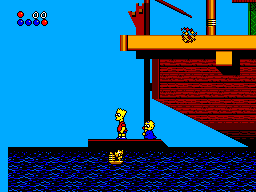 In addition, they removed a critical issue in the NES version, this being that when you superjump with Bart, he tends to keep running when he lands, thus making you quickly check in the other direction to stop him from falling off platforms. For small platforms, this gets annoying. In this version, however, Bart jumps and stays still because they changed it so that, should you desire to run faster, you have to first jump in place and then hit the direction you want to go. It may sound minor, but trust me, this really makes the play a lot better in this version. Due to the recent high score contest, I actually played this game quite frequently and discovered absolutely every possible secret you could find, beating all fools below me in the process. However, considering the game has been totally stripped down, I don't think I'll be coming back to it in the future too soon, if even in the next century. The NES version unfortunately has more to offer because it was finished properly. Bart Vs. The World is a fun title for the Master System and a good platformer if you're a fan of that genre. Just be aware, should you choose to play it, it seems to be unfinished and there are several critical areas of play that are missing. However, in spite of this, it has a charm to it and plays better than the NES version in certain regards, so I'd say it's worth at least a brief look.